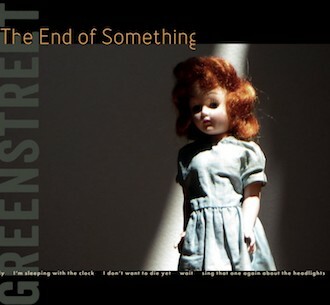 Kate Greenstreet’s latest book, The End of Something, opens with a quote on the first page, paired with a picture of a wide-eyed redheaded doll: “I dreamed I was a thousand years old and then, when I woke up, I was a thousand years old and I thought: am I dreaming?” The book itself is a dreamscape, and as I’ll show, there are different facets of what Greenstreet is doing that have played out in her previous books, too. The book has all of Greenstreet’s well-known varied voicings and form in it: it’s the perfect follow-up to any of her other books, all of which echo one another in repeating patterns and lines. The speaker seems to lament something, or at least it feels as if she is lamenting missed encounters and human relationships that never quite transpired. In previous books, she has written about the impermanence of life and love, and she continues that trend here, and she does it beautifully. A psychic once told me I had the mind of a nun. As if there would be only one kind, for nuns. The offices of seers we consulted in the South sometimes had chickens. The vestibules were swimming with the poor—bobbing, drowning, in our lake of dream and wishes. Tell me everything you want to do while there’s still time. That didn’t make them good. The escaped convict’s story is a traveling story. The language is full of gaps and problems of tense. One time you asked for a sign and found a shell. Add one minute for every thousand miles. Apparently, in this dream, we are dealing not just with a “refuge of sinners, cause of our joy,” but we are also dealing with wisdom, who had “built herself a house in the dream.” The speaker is “twins, … looking for something.” I wonder, as I read this, what is this meant to be a mirror of? Some would say that mirrors are misplaced, but as Greenstreet writes it, something changes in the dream to become more beautiful, and it’s difficult to figure out exactly what it is that is changing so rapidly. The speaker clearly seems to be living in a Lacanian dream, a dream that is taking place in a mirror, perhaps where doppelgangers abound. How she got to be a ghost was that she ate a plate of spiders—a plate of plastic spiders that were meant to scare people, not to be eaten. The little sisters told me this. She wants to tell me things. I actually had a coke dream last night. I used to have them a lot, now not too often. They’re awful. Typically, I’m snorting it off the floor, off a really filthy rug or something, which I never even did in life. But the dreams really bring it back: how you just don’t care. About anything. And how, as soon as you start, you’re already in a bad mood and all you want is more. After a while, it wasn’t even exactly about the high for me. I mainly wanted the feeling of it burning up my nose into my head. a doll. She can’t talk. It’s like talking to a ghost, in a way. I mean, ghosts can’t really talk to you, they don’t exist. —You’ve had experiences, though, haven’t you? With things that don’t exist, or figures that appeared…? —I have. And I don’t know what that means. I have no idea. I used to believe in things more. That’s my other life following me. Woman driving a pale green pickup, hood secured with a length of chain. Two little kids sitting with her. No front plates, mirrors built out from the sides. Her elbow resting in the open window, beaded necklaces swinging from the rearview—two strands, pink and blue. I think she’s singing. Can’t tell if she wants to pass. This is her chance. These poems in The End of Something pick up where others of Greenstreet’s books leave off, and they create the sense of an ending of youth, of early life, and perhaps of twinhood. Much of Greenstreet’s other work is centered in her voicings, in her ability to weave magical places where one might want to live, but this book seems to lament, through all its pages, the death of that magic. I find Greenstreet’s work always riveting and truly conversational, and this book is no different. The End of Something weaves a tale that we’ve not quite heard before, and it does it beautifully. If you’ve got the inkling to read something that is both quietly on fire and subtly critical, then you won’t be sorry if you go with this book.